Marché St. Eustache-Les Halles is all that remains of what was once the site of the city's largest food market. Later replaced by Rungis, Les Halles was where chefs, store owners, and shoppers of all sorts came to stock up on fresh ingredients. 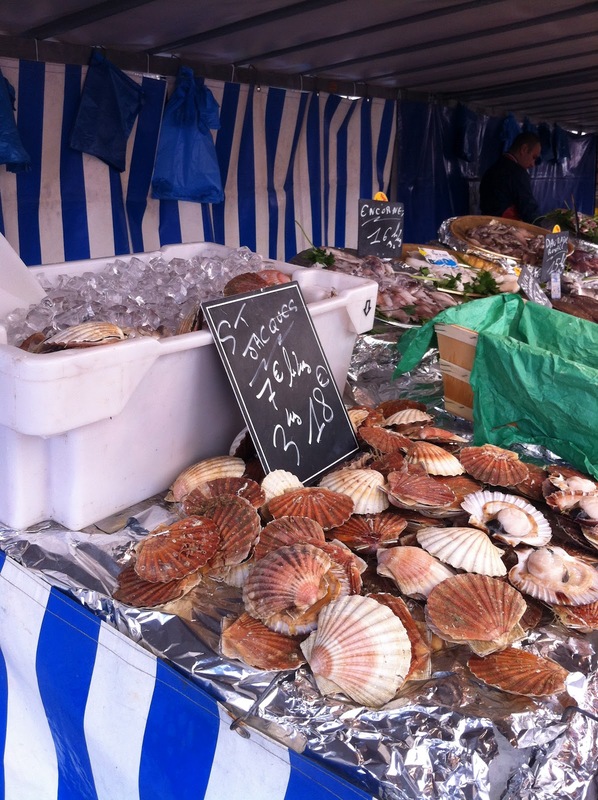 Whether you are attracted by the history of this marketplace, it's central location near the charming Montorgueil neighborhood, or the convenient hours it keeps, there are plenty of reasons to visit the vestiges of what once was Paris' primary food source. It is worth noting that this market, along with a few others including Marché Bourse and Marché Anvers, is one of a small number of Parisian food markets that stays open late enough on a weekday for shoppers to stop by on their way home from work. What remains of the market is hardly a fraction of its predecessor and, unfortunately, there is not a farmer in sight at any of the stands that line the rue Montmartre. However, the products on offer are mostly of French origin and predominately seasonal. French vegetables, chickens, and cheeses are for sale at various stands and the poissonerie was proudly displaying Coquilles St. Jacques (scallops), for which the fishing season opened on the 1st of October. 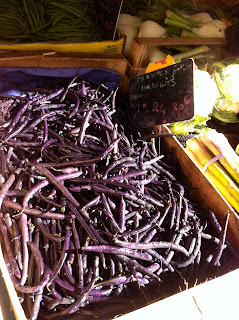 I was attracted by some heirloom veggies, including gorgeous purple "haricots verts" at a stand that was manned by a seller who knew his stuff. He instructed me how to prepare the "green" beans and then served me some lovely cèpes and told me what to do with those, too. He bagged up my dinner ingredients as the smells of hot lunch wafted through the market stalls. Like most afternoon markets, Marché St. Eustache-Les Halles caters not only to forward-thinking shoppers who are getting the evening's groceries, but also those who seek instant gratification and some homemade ratatouille on their lunch break. The majority of the produce at my chosen veggie stand seemed to come from France and the vendor's knowledge of each product implied an interest and investment in his profession. Doubting very much that he was actually the grower of the vegetables (the selection was too large and varied to come from one farmer), I decided to ask if he was a producteur anyway. "Mais non!" he responded, slightly offended. "How can you expect me to be the producer- I spend all my time at the markets!" Point taken. This is an unavoidable issue for the independent producers that we see at markets, who have to split their time and lengthen their days by being both grower & seller of their produce. 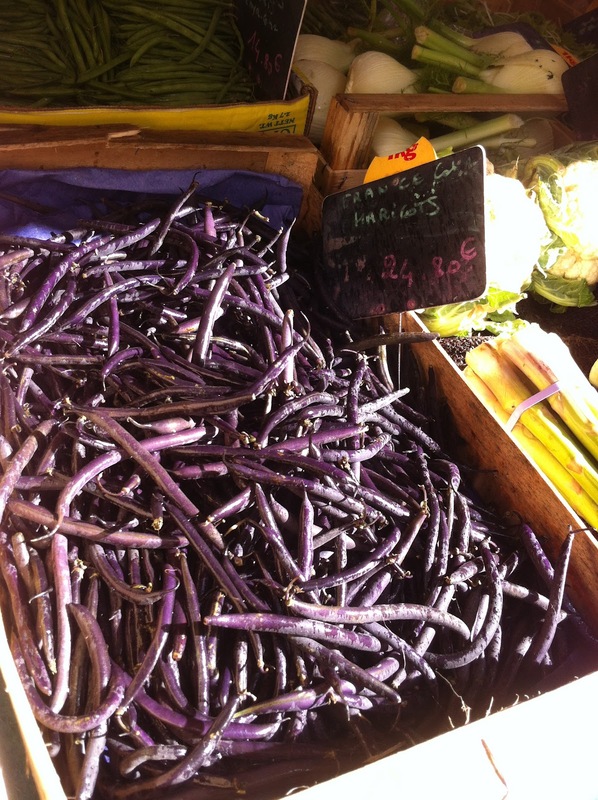 So while there are no local producers present at the Marché St. Eustache-Les Halles, it is still possibel to find French-grown food and quality products, all while enjoying a stroll around this truly charming neighborhood. Paris Paysanne has a new website!